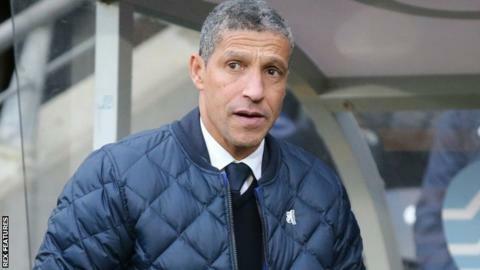 Brighton & Hove Albion manager Chris Hughton says his squad must rediscover their best form to end a run of seven Championship games without a win. The Seagulls begun the campaign with a 21-match unbeaten run but have slipped from first to sixth in the table. "This is our poorest period after an excellent start. We need to get back to what we do best," he told BBC Sussex. "The level of competition is no different to what it was at the start of the season when we were doing well." Brighton's first defeat of the season came against table-topping Middlesbrough on 19 December and the Sussex club have lost four of their last five games in the Championship. Having been 13 points clear of seventh place in early December, Albion could slip out of the play-off places for the first time this season on Saturday. "It has been a difficult period for us," Hughton added. "We have conceded poor goals, we haven't taken leads and we are not scoring enough goals. "The only way to remedy all of them is to make sure we believe in our principles and work hard." One factor in Brighton's dip in form has been a goal drought which now stands at 575 minutes in all competitions, stretching back to Rajiv van La Parra's strike against QPR on 15 December. Despite their current struggles up front, Hughton says the club "mustn't panic" in the transfer market during the January window - having already bought winger Anthony Knockaert from Standard Liege. "We have to be conscious that at the end of January we need the best squad available that we can to go through to the end of the season and be exactly where we want to be," the 57-year-old said. "We are working very hard to bring in what we need to give us competition in the squad."